Today, the Washington DC Quarter Coin remembers the weather news of February 13, 1899. The Terrible Storm Now Raging in Washington. Surpasses Any Former Storm Known Here. All the Railroad Trains Many Hours Delayed. Through a vale of snow, whirling about at the rate of thirty-six miles an hour, a prediction comes from the weather bureau. It is the single gleam of hope held out to snow-bound Washington and it foretells fair weather. Unless all indications fail the clouds will break away tonight, and for the first time since Saturday afternoon there will be a cessation of precipitation in the form of snow. The thermometer, it is stated will again reach down to the zero point, the cold continuing throughout tomorrow. A significant feature of the cold weather is a phenomenal rise reported this morning in the west. At Miles. Mod., the mercury has jumped upward 64 degrees in the last twenty-four hours, being now away above zero and warmer than the east. This very decided warm wave is traveling eastward and will probably be felt in this section Wednesday or Thursday. The thaw which will surely set in at that time is attracting the attention of the authorities and causing no little apprehension. The capital city of the nation is today a dreary, desolate waste of snow. Business is suspended to all purposes, and this usually bustling, up-to-date national metropolis is a city dead. The street cars, after bravely attempting to run all morning, were compelled to give up the futile efforts shortly before noon. The drifting snow piled high on the tracks, and all the snow ploughs available could not keep the right-of-way clear. A dejected crowd of motormen and conductors formed in procession and marched up the tracks to the various stations where they have to report. Thirty inches of snow on the level where the wind does not strike is the record breaking depth registered in Washington. Sixteen inches of this total has fallen since Saturday afternoon, the precipitation being continuous since that time. A gale from the northwest, which at 11 o’clock this morning reached a velocity of thirty-six miles an hour, has blown the dry snow into drifts in many places six or eight feet in height. The streets are a veritable sea of white, the snow drifts resembling the ocean waves. A sand storm in the Sahara does not compare with the conditions prevailing in Washington today. The snow, fine and dry, is caught up by the raging winds and hurled through space, making it impossible for one to see more than a few feet ahead. The cold wind bites bitterly and the snow stings severely, making life out of doors almost unbearable. The scene presented in every quarter of Washington this morning was perhaps the most remarkable ever witnessed here. The present blizzard surpasses in severity that of 1888 which has been the criterion of all storms up to the present time. In depth of snowfall, in minimum temperatures and in all stormy conditions known to humanity has the present ”unpleasantness” outstripped all competitors. Looking out of the window this morning Washingtonians beheld a sight witnessed but times in the course of a life. The snow which set in so fiercely Saturday evening instead of ceasing, as was predicted by the weather bureau, continued to fall in great quantities with a persistency fairly fiendish. Suburbanites found themselves snowbound behind drifts four and five feet high. Egress was impossible. and if it was not an imperative case no one stirred out of doors. In the city proper the conditions were practically the same. Sidewalks were impassable and still remain so. The law regarding the removal of snow could not possibly be enforced under the circumstances. The few pedestrians whose business affairs called them out walked in the middle of the street. In the car tracks and wherever the wind had swept a fairly clean passage way. Those unfortunates who left home with umbrellas soon found cause in plenty to make them regret their folly. The high winds caught frail protectors and tore them into threads after turning things wrong side out and every other way known to the antics of a stiff breeze. A procession of struggling humanity has passed up and down Pennsylvania avenue all day, the line of march being in the Capital Traction tracks. The shelter offered by a belated vehicle is eagerly sought and the procession has taken up its march onward with cabs and small delivery wagons as pacemakers. Trains have stopped running, the snow drifts making the tracks in and out of the city impassable. Navigation on the river is suspended and will likely remain so for many days to come. The channel is blocked with ice. If the river were not frozen, however, the blinding snow storm would make navigation a hazardous business not to be attempted. Coal in the city is very short and there is none in sight other than the meager supply now on hand. Telephone and telegraph wires are down just outside the city limits and the terrible weather prevailing makes it practically impossible to carry on any extensive repairs. Business in Washington has been carried on over the telephone wires as far as this has been possible. Grocers are careful of their stocks and have curtailed the orders of their regular customers. The freight trains cannot reach the city and they do not know where fresh supplies are to be had. At the market prices have taken a jump skyward at an alarming rate. Eggs that were selling Saturday at 25 cents per dozen are hard to get today at 36 cents. The rise in prices of vegetables and all sorts of meats and provisions has been in the same proportion throughout the list. Delivery of these goods has not been attempted to any extent. Those persons in need of food and having the money with which to purchase at the increased prices have to send their own servants with orders to personally bring in the stores. The storm, which has been regarded rather lightly during the past week, interest being maintained by its record breaking doings, has now become a thoroughly serious affair and one calling for deep thought. The poor of the city are in a terrible plight. The charitable organizations are doing all in their power to relieve suffering, but the agents of these associations are but human, and cannot be expected to perform miracles. The Evening Star’s pound party will do much to improve the starving condition of many. The plan adopted for distributing the food received in response to this appeal assures this much. The people of Washington will perhaps never again be called upon to contribute to a worthier cause. The present storm will not be equaled again perhaps for a generation, and the destitute will not be again placed in such a dire position. It is difficult to realize the havoc the continued blizzard has wrought. All building operations and out-of-door work, furnishing employment to that large class of the city’s population, the common laborers, have been suspended for the past ten days, and so many men have been deprived of their sole means of support. Even the snow cleaning work inaugurated by the District commissioners has been brought to a halt and another 1000 men thrown out of places. The little sums of money put away for a rainy day have vanished before the snowy days that have been upon Washington for a week or more past. The poor are left helpless and hopeless, and must be relieved from outside sources, from people who do not know the sufferings of want. Through all of today it has snowed. The downfall has been accentuated by the wind’s blowing about of that already upon the ground. The storm has demoralized everything and everybody. The temperature has not been as low as for some days previous, the minimum this morning being 6 degrees above zero at 8 o’clock. It will be colder tonight, however, when the second cold wave will have set in. This spell of coldness will be quickly followed it is promised, by warmer and fair weather which promises to bring relief. The conditions at present are appalling. Numerous cases of frozen fingers, hands and feet, as well as other exposed portions of the body have been reported to the police and the sufferers treated at the various city hospitals. Those persons who are out have been compelled to walk. Their faces are covered with ice before they have gone many feet and the man with a mustache or beard has found it a nest of icicles. The city mails have been delivered as promptly as possible. Few outside pouches have been received at the city post office. The mail collection wagons have continued to navigate behind a quartet of strong horses. A few express wagons have also managed to make their way through the snow behind as many horses. The most woebegone looking affair on the streets, however, was an ice wagon snowbound and stalled. Funerals have not been held, except in rare instances, for many days past. 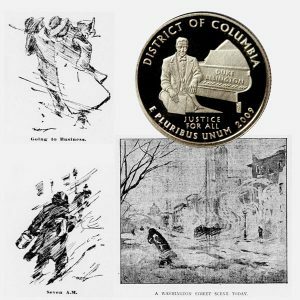 The Washington DC Quarter Coin shows with artists’ images of the winter storm of February 1899.